The Jean-Christophe VITTE training school, there are also tailor-made programs upon request of participants. You want to start? You need to perfect a technique or develop your activity? Do you want to motivate your employees, strengthen the team spirit and cohesion within your company, create customers’ loyalty, organize a challenge or celebrate a particular event? Are you looking for an original and welcoming place to share a good time with friends or family? The team of Jean-Christophe VITTE develops the ideal formula to make it your great moment! With their experience and know-how, our team of professionals analyzes and evaluates your needs, your assets and the facing challenges in order to define a tailor-made training plan, whether you are a company manager, carrying a project and whether you have experiences or not. Depending on your availability and your budget, we develop a unique program, adapted to your activity, your teams and the culture of your company. > Train your teams by taking into account the existing material, based on a chosen theme. > Strengthen the skills of your teams. > Optimize your working methods and organization. > Define a winning strategy to develop your turnover. > Accompany and provide expertise for the launch of a project about food trades. > Offer practical and personalized operational training immediately. > Develop menus or a complete range of products. The Jean-Christophe Vitte training school offers you an unforgettable training experience! 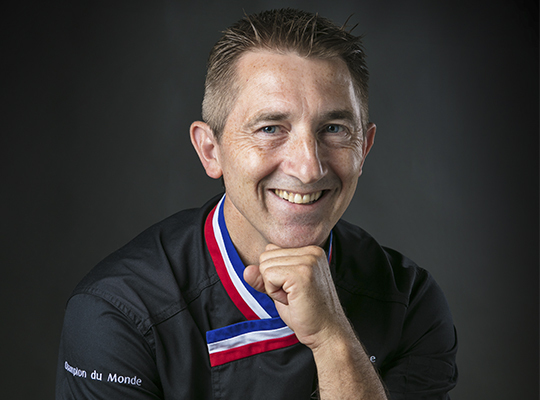 For professional events such as “Team building”, group relation day, incentive, commercial event, retirement celebration etc., the training school Jean-Christophe VITTE offers to book a private workshop only for you. > Private lessons based on a theme of your choice with tastings of the creations. > A particular desire? Our team is at your disposal to offer something that will meet your needs and your desires. > Hosting your festive events (Christmas tree, end of year party, etc.) with demonstrations (recipes, ice carving, etc.) or workshops according to your desires. > Prepare your gourmet cocktails. For a special occasion or simply the desire to share a good time with friends or family (birthday, family event, bachelor party for girls or boys, etc. ), the workshop can be privately booked upon request and is in line with your desires: choose the format, the theme, the date and your guests and come share a fun and unforgettable moment. > A cooking class reserved for your group, under the guidance of our chef. You enjoy your achievements with friends or family. It is customizable according to the event and the desired theme. > Children’s birthdays: the group prepares 2 or 3 recipes under the advice of the chef. For this birthday party pastry, we plan to buy candles and to give presents to kids (which you brought before the party). L'événement vous a plu ? N'hésitez pas à en parler à vos proches ou votre comité d'entreprise !